Studies were carried out to evaluate the allelopathic potential of four hexaploid wheat (Triticum aestivum L.) cultivars (Millat-2011, AARI-2011, Lasani-2008 and Faisalabad-2008) at different growth stages tillering (Z30), anthesis (Z60) and maturity (Z90). The objectives were to ascertain wheat allelopathic potential to suppress emergence and establishment of important grassy and broad-leaved weed species and characterize soil microbial dynamics and enzyme activities under wheat allelopathy. The overall goal was to characterize the variability in wheat allelopathic potential with respect to plant age, cultivar-specific differences, and relevance to soil functional diversity. One field experiment and four wire-house experiments were carried out at the Student Research Area, University of Agriculture, Faisalabad. Field Experiments: The soil at the experimental site belongs to the Lyallpur Soil Series (USDA classification-Aridisol-fine-silty, mixed, hyperthermic Ustalfic, Haplargid; FAO classification -Haplic Yermosols). Wheat cultivars were sown in 4 m × 10 m field plots, and were maintained either weedy or weed free. Fallow plots (without wheat) were used as a control. Trials were laid out in randomized complete block design with four replications. Data were collected on crop growth, weed density and dry biomass, soil chemical and biological properties. Herbage of wheat cultivars was collected at tillering, anthesis and maturity for biochemical analysis. Weed densities were significantly lower in plots sown with wheat than in control plots. Floristic composition of weeds varied significantly among wheat cultivars and between years. A total of seven broad leaf (swine cress, lambsquarters, blue pimpernel, field bind weed, sweet clover, fathen, fumitory and broadleaf dock), three grassy weeds (canarygrass, and bermudagrass) and one sedge (purple nutsedge) belonging to seven distinct families (Poaceae, Chenopodiaceae, Brassicaceae, Primulaceae, Cyperaceae, Fabaceae and Convolvulaceae) were identified. Summed dominance ratios of the weeds were in the order: swine cress > lambsquarters > blue pimpernel > canarygrass > field bind weed > purple nutsedge > sweet clover during 2011-12, and swine cress > blue pimpernel > lambsquarters > canarygrass > field bind weed > purple nutsedge > sweet clover during 2012-13. Summed dominance ratios changed during the growing season due mainly to variation in emergence timing of different weeds; sweet clover emerged at 60 days after sowing (DAS) and broadleaf dock at 75 DAS during 2011-12. Sweet clover and broadleaf dock were identified at 45 and 60 DAS during 2012-13, although during 2011-12, these weeds were absent at these times. Total weed dry biomass at 45 DAS ranged from 0.81-1.39 g m-2 during 2011-12 and 0.45-0.83 g m-2 during 2012-13 in plots sown with wheat compared to 13.02 g m-2 and 2.78 g m-2 in fallow plots, for respective years. At 105 DAS, total weed dry biomass was significantly lower (4.96-14.13 g m-2 and 5.02-6.11 g m-2) in wheat-sown plots than fallow plots (109.38 and 183.24 g m-2) during 2011-12 and 2012-13, respectively. HPLC profile of allelochemicals revealed that wheat herbage contained eight compounds: gallic acid, p-hydroxybenzoic acid, syringic acid, ferulic acid, vanillic acid, protocatechuic acid, p-coumaric acid and benzoic acid. Concentrations of these allelochemicals varied among wheat cultivars and with stage of growth. 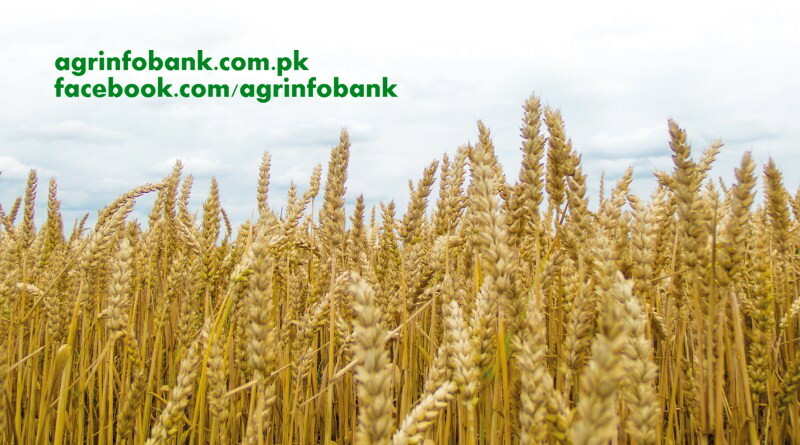 Concentration of total allelochemicals in 2 wheat cultivars was in order: AARI-2011 > Lasani-2008 > Millat-2008 > Faisalabad-2008, and for growth stages the order was maturity > anthesis > tillering. Higher total phenolic content was recorded in field soil collected at maturity stage of wheat than at tillering and anthesis stages. During the two growing seasons maximum phenolic content (51.73-60.23 mg g-1 soil) were recorded for soil from AARI-2011 plots as compared to fallow (control; 18.09-14.59 mg g-1 soil) respectively. HPLC analysis of wheat-amended rhizosphere soil showed that concentrations of root-exuded, phytotoxic compounds varied with cultivars and the stage of growth of wheat. The overall concentration of allelopathic compounds in rhizosphere soil collected at tillering stage was in order: ferulic acid > benzoic acid > p-hydroxamic acid > gallic acid, at anthesis stage p-hydroxamic acid > ferulic acid > vanillic acid > benzoic acid > p-coumaric acid > syringic acid > protocatechuic acid. However, at maturity the order was p-hydroxamic acid > ferulic acid > benzoic acid > protocatechuic acid > syringic acid > vanillic acid > p-coumaric acid. Maximum invertase, dehydrogenase, cellulase, and phosphatase activities in rhizosphere soil of all wheat cultivars were recorded at anthesis and maturity as compared to tillering. These activities manifested a temporal increase as soil microbial activity, microbial-carbon and -nitrogen increased at the later growth stages (anthesis and maturity). Pot Experiments: Dried herbage was incorporated at 8 g kg-1 soil in plastic pots (10 cm × 26 cm). Control treatment was comprised of soil without herbage. At 7 days after incorporation of herbage, 20 seeds each of canarygrass (Phalaris minor Retz.) and common lambsquarters (Chenopodium album L.) were sown in each pot including control pots (without herbage). Separate experiments were carried out for both the test species. A similar but separate (blank) experiment was set wherein no weed species was grown, to explore the decomposition pattern of wheat herbage and its impact on activities of soil microorganisms and extracellular enzymes. The release of phytotoxic compounds was quantified over a 6-week incubation period. In another set of experiment, leachates were collected from wheat-sown and control pots (soil without wheat). These leachates were used in another set of pot experiment wherein canarygrass and lambsquarters were sown. A separate pot experiment was conducted to appraise the interference potential of wheat cultivars on emergence and seedling growth of test weed species (canarygrass and lambsquarters). For this purpose, wheat cultivars and test species were sown in 1:1 ratio in plastic pots. Control pots contained only one seed type (either of wheat or weed seed). Allelopathic potential against the weed species was evaluated on the basis of seed germination and seedling growth; and biochemical and antioxidant enzyme analyses were carried out to understand the basis for possible allelopathic interference. To have an insight into rhizosphere ecology analyses of microbial abundance (population of bacteria and fungi, soil-microbial-biomass-carbon and -nitrogen) and analysis of extracellular enzymes (cellulase, urease, invertase, dehydrogenase, phosphatase, and polyphenol oxidase) were performed. All pot experiments were conducted using completely randomized designs with four replications. Experiment-I A: Incorporation of herbage collected at anthesis and maturity stages of wheat cultivars AARI-2011 and Lasani-2008 prolonged mean emergence time of canarygrass to greater than the control. Final emergence percentage dropped by 13-31% in response to soil incorporation of herbage collected at different growth stages. Maximum suppression of shoot (33-51% and 28-53%) and root (34-52% and 28-54%) lengths and seedling dry biomass (66- 3 88% and 58-86%) of canarygrass over control was also observed with the aforementioned treatment combinations. Total chlorophyll content declined where herbage collected at anthesis and maturity stages of all wheat cultivars was incorporated into soil, but phenolic content was higher than with the control where herbage collected at tillering was applied. Activities of enzyme antioxidants also varied among wheat cultivars, and declined with the incorporation of herbage collected at anthesis and maturity but were enhanced by tillering stage herbage compared with the control. Wheat herbage induced lipid peroxidation in canarygrass seedling. Higher malondialdehyde (MDA) content (1.28 and 1.14 nmol g-1 FW) was observed by the incorporation of herbage of wheat cultivars AARI-2011 and Lasani-2008, respectively. Anthesis- and maturity-stage herbage of AARI-2011 and Lasani-2008 was more phytotoxic than that of Millat-2011 and Faisalabad-2008. Moreover, herbage of all wheat cultivars collected at tillering stage had a stimulatory effect on emergence, seedling growth and biochemical attributes of canarygrass. Experiment-I B: Mean emergence time (MET) of lambsquarters was prolonged over control with herbage of all wheat cultivars collected at anthesis and maturity stages. Final emergence percentage dropped by 3-17% in response to herbage collected at different growth stages. Maximum suppression of shoot (45 and 78%) and root (60 and 90%) lengths, and seedling dry biomass (65 and 96%) of lambsquarters over control was recorded in response to amendment with herbage collected at anthesis and maturity stages of wheat. Total chlorophyll content declined to lower than the control in response to incorporation of herbage from all wheat cultivars collected at anthesis and maturity stages. Phenolic content, on the other hand, increased. Activities of enzyme antioxidants extracted from lambsquarters varied with wheat cultivar and declined with the incorporation of herbage collected at tillering, anthesis and maturity stages. Wheat herbage induced lipid peroxidation in lambsquarters seedlings, and higher MDA content (0.56 and 0.77 nmol g-1 FW) was observed with the incorporation of herbage collected at anthesis and maturity stages, respectively. Herbage of Millat-2011, AARI-2011 and Lasani-2008 collected at anthesis and maturity stages was more phytotoxic than that of Faisalabad-2008 collected at the same stages. Moreover, herbage of all wheat cultivars collected at tillering stage only mildly inhibited emergence, seedling growth and biochemical attributes of lambsquarters. Experiment-II: Wheat herbage amendment increased soil pH, phenolic content, organic-carbon and -nitrogen content compared to nonamended soil. Total carbon, total nitrogen, total soluble phenolic content, and saturated and unsaturated fatty acids were significantly different in soil amended with wheat herbage collected different growth stages. Maximum total carbon and nitrogen were observed for herbage collected at anthesis and maturity stages compared to herbage collected at tillering. Both of the organic-carbon and -matter significantly increased with progression in incubation time where wheat herbage was incorporated into soil; whereas these soil components declined in nonamended soil. Analysis of herbage-amended-soil during different incubation periods showed that microbial population, and activities of extracellular enzymes (urease, invertase, dehydrogenase, and phosphatase) increase during the six-week incubation period. All these activities were higher in the soil amended with herbage of Millat-2011 and AARI-2011 collected at anthesis and maturity stages than with those of Lasani-2008 and Faisalabad-2008 collected at same growth stages. The concentrations of phytotoxic compounds from decomposing wheat 4 herbage also differed with cultivar, stage of growth at which herbage was collected, and the incubation period. HPLC analysis of soil extracts from soil amended with wheat herbage showed that they contained eight phytotoxic compounds gallic acid, p-hydroxybenzoic acid, syringic acid, ferulic acid, p-coumaric acid, vanillic acid, protocatechuic acid and benzoic acid the concentrations of which were dependent on growth stage and the duration of herbage incubation in the soil. Experiment-III A & B: Application of leachates from herbage-amended soil affected emergence dynamics of both canarygrass and lambsquarters seedlings in a cultivar-dependent manner compared to the control. Leachate from AARI-2011-amended soil significantly reduced the final emergence (14 and 23%) and seedling dry biomass (36 and 64%) of both canarygrass and lambsquarters, respectively, compared to the control. Application of leachates from soil amended with AARI-2011 and Lasani-2008 herbage significantly reduced the protein content of canarygrass (48-53%) and lambsquarters (90-92%). Catalase and peroxidase activities of canarygrass (272% and 45%) and lambsquarters (83 and 82%) also declined under the influence of leachates from AARI-2011-amended soil compared to the control. Reduced superoxide dismutase activities were recorded with the application of leachates from soils amended with all wheat cultivars compared to control for both weed species. Application of root leachates significantly influenced the populations of soil bacteria and fungi compared to control. Maximum increases in microbial populations and soil enzymatic activities were recorded under the influence of root leachates from AARI-2011-amended soil in both canarygrass and lambsquarters sown pots. Experiment-IVA & B: None of the wheat cultivars showed reduction in emergence and seedling growth in response to interference by canarygrass and lambsquarters when grown in a 1:1 ratio. Emergence index and final emergence of canarygrass were inhibited by 25 and 21%, respectively, when grown with wheat cultivars. Similar results were recorded for lambsquarters. Reduction in shoot length (39%) and seedling dry biomass (79%) of canarygrass occurred due to interference of wheat cultivars compared with the control. Shoot and root lengths of lambsquarters were significantly reduced (43% and 48%, respectively) compared to the control. Interference of wheat cultivars reduced the seedling dry biomass of lambsquarters by 49%. The highest reduction was recorded with AARI-2011. It can be concluded from the results of the present investigations that wheat demonstrated allelopathic potential that varied with cultivar as well as growth stage. Wheat cultivars AARI-2011, Millat-2011 and Lasani-2008 were more allelopathic at anthesis and maturity stages than at tillering stage. Wheat cultivars and the stage of crop growth resulted in modifications in rhizosphere microbial communities that may be due to the release of allelochemicals during the herbage decomposition process. Phenolic content of herbage increased with advancement in stage of wheat growth, which was also evident in soil amended with such herbage. The information generated provides evidence in support of soil incorporation of herbage of specific wheat cultivars to manage weeds of economic significance in wheat-based cropping systems and for increasing soil quality.